Crew Resource Management: Cure for Amtrak’s safety woes? Amtrak has a new Executive Vice President and Chief Safety Officer, and he is a former chief safety officer at both Northwest Airlines and Delta Air Lines. The Jan. 9 appointment of Ken Hylander clearly signals that Amtrak CEO Richard Anderson—also a Northwest and Delta alumnus—has decided the passenger railroad’s safety programs need a wholesale overhaul. Hylander’s three-decade airline management resume also includes leading the Delta Connection Safety Alliance and 17 years at United Airlines. He is the Chairman of the influential Flight Safety Foundation’s governing board. At Amtrak, Hylander will report directly to Anderson. Anderson and Hylander have a big task ahead. U.S. passenger airlines and U.S. railroads—both freight and passenger—ended 2017 with polar opposite safety records. Fixing the railroads may require more than just Positive Train Control, the massive technology injection that has shattered original budget estimates and eluded full implementation for years. Anderson and Hylander might consider adapting a proven airline industry training and operations management program called Crew Resource Management (CRM). When paired with PTC, CRM might bring U.S. passenger railroad safety levels closer to that of U.S. airlines. Sadly, 2017 ended badly for Amtrak. Just a few days before Christmas, Amtrak train #501, a high-visibility inaugural run for expanded Cascades service, tumbled onto Interstate 5 south of Tacoma, Wash. Suspected railroad crew training issues were in the headlines for days. And while final Federal Railroad Administration numbers for 2017 aren’t available, media reports chronicled the sad stories of eight U.S. railroad employees who died in safety-related railroad incidents. In spite of the railroads’ best efforts, including work by a dedicated corps of safety professionals, the rail industry has never gone a calendar year without an employee or contractor fatality. In sharp contrast, scheduled U.S. passenger airlines ended 2017 with an exemplary safety record—0 crashes, 0 crew fatalities, and 0 passenger fatalities. That’s zip, zero, nada. Further, 2017 was actually the eighth calendar year that scheduled U.S. passenger airlines could make this claim! When Richard H. Anderson joined Amtrak as Co-CEO last year, he promised to improve customer service. By all accounts, Anderson’s CEO tenures at Northwest and Delta were highly successful. Amtrak supporters have clear expectations that his previously demonstrated passenger service management skills soon will transfer to the government railroad. As 2018 begins, veteran railroad manager Wick Moorman is gone. Anderson now is alone in the Amtrak CEO suite. And with the Cascades wreck still making occasional news, Anderson’s appointment of Hylander says “how Amtrak does safety” is about to undergo a transformation. Odds are high that hefty injections of airline-style safety programs will be applied to fix Amtrak’s imperfect safety record and tarnished image. One of the proven tools Anderson and Hylander could deploy is a version of CRM, an airline training and flight operations management system designed to help airline flight crews avoid Human Factor performance failures. Properly modified, CRM could become a cornerstone of the safety management system recommended by National Transportation Safety Board. Amtrak has endorsed that recommendation. Initially conceptualized in the late 1970s, airline CRM systems focus on crew communications, decision-making and leadership. CRM recognizes that aircrew performance may decrease as task complexity grows and provides training and tools designed to help a Captain and First Officer effectively handle increasingly complex tasks. And it’s Human Factor performance failures that have figured prominently in the causes of four major passenger train accidents—Spuyten Duyvil (2013, Metro-North); Frankford Curve (2015, Amtrak); Hoboken Terminal (2016, NJ Transit), and the Amtrak Cascades debacle. In all four calamities, railroad operating crews rolled into a speed restriction significantly above the speed limit. Other factors were involved, including lost situational awareness, fatigue and engineers’ chronic medical conditions, such as obstructive sleep apnea. The fatality and injury totals from the four events are unsettling to stakeholders—16 dead and approximately 437 injured. Among those stakeholders is the U.S. Congress, the folks controlling Amtrak’s and the big commuter railroads’ substantial subsidies. I came face-to-face with CRM four years ago on a 3.5-hour trip in a major airline’s Boeing 757-200 flight deck. I was looking for a training strategy that railroad operating crews then under my safety supervision could apply to avoid running through switches and derails that had been in the same locations for decades. Now obviously, taking Amtrak’s Southwest Chief out of Dodge City at 70-plus mph and getting a B757 across the country does not create an apples-to-apples comparison. But in 2013, U.S. airlines clearly were “doing safety” better than U.S. railroads. I wanted to see first-hand one of the systems acknowledged as essential to the U.S. airline industry’s safety record. The trip started with an extensive crew briefing, which included the flight attendants, before the crew even got onto the aircraft. The captain did a thorough walk-around aircraft mechanical inspection. But once on the flight deck and strapped into the four-point jump seat restraints, it took fewer than 10 seconds to appreciate the magnitude of difference between the communications heard in a locomotive control cab and the aircraft flight deck. There were checklists—before engine start; after engine start; before taxi; before take-off—and many more as the flight changed altitude, took different headings, and landed. The captain and first officer were always talking to each other. The net results of this communication was a system that put at least two sets of trained eyes (and minds) on every critical crew decision. Flight attendants were an integral part of the CRM process. After all, their primary responsibility is passenger safety, not Cokes and Seven-Ups. When crunched in a middle seat, passengers don’t see the critical safety duties for which flight attendants are responsible. What I saw was not a show for the visitor. Having had brief prior glimpses of flight deck procedures (on movie studio charter trips), I am convinced this was the way things were done—on every flight, every day. Clearly, the U.S. airline industry’s safety record proves CRM’s effectiveness. Should Anderson and Hylander contemplate installing a modified CRM system at Amtrak, they likely will face headwinds and at least Level 3 turbulence. 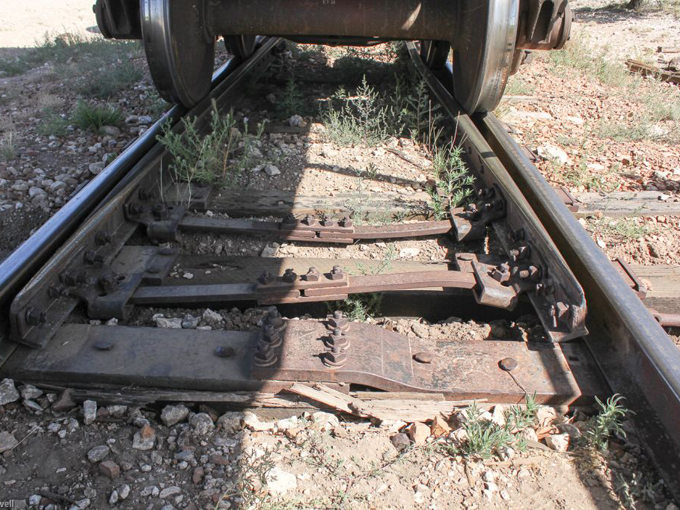 After all, DNA-level change in the railroad industry historically has always been difficult. Congressional priorities: Over the past ten years, Congress has been hesitant to truly prioritize epic changes in railroad safety training. The rail industry has been a good self-starter when it comes to training, testing, qualification and certification program improvements. Consider the snail’s pace of Rail Safety Improvement Act (RSIA) implementation. Passed in October 2008, RSIA’s Section 401, Minimum Training Standards and Plans, mandated improved railroad employee training. As it now stands, some RSIA-required training improvements won’t be in place until 2024. 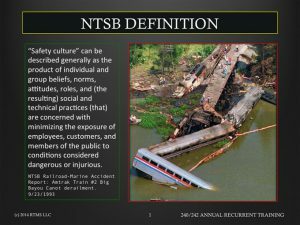 49 CFR Part 243, Training, Qualification, and Oversight for Safety-Related Railroad Employees, (downloadable at the link below), does not require dramatic rail training enhancements. The regulation mostly focuses on organizing, labeling and documenting existing training courses and training contractors. Notably, Part 243 fails to put forth specific instructional strategies to eliminate Human Factor incidents. Eliminating Human Factor incidents rated only brief mentions during Part 243’s prolonged rulemaking. In the eyes of many, Part 243 is a “90% paper shuffle.” Airline-style training and operations safety programs will leave Part 243 in the dust. Unions: It’s unknown how Amtrak’s unions, and the unions representing state and regional passenger railroads, would respond to a CRM program. Many unions view additional operating practices and safety rules as a way to shift responsibility for employee failures away from management. They call it “Blame The Employee First” and might see CRM training as another strategic step in the wrong direction. Additionally, airline CRM training is rigorous. Not everyone passes. Rail unions might worry that some of their members, whose study and learning skills are rusty, might not make the grade. 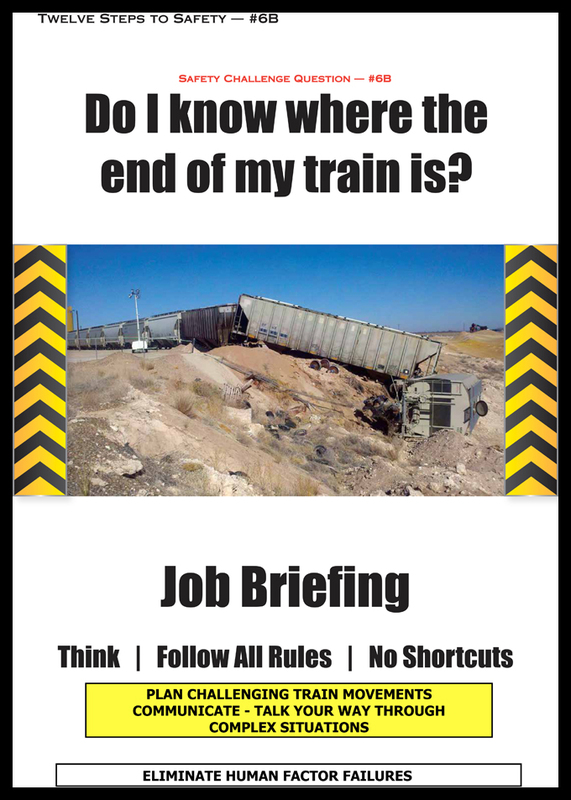 Every railroad manager has encountered very competent and safety-conscious railroaders who “simply don’t test very well.” Both labor and management will worry that CRM might result in some good employees being disqualified. Management Challenges: Lower-level Amtrak managers may raise objections. However, Hylander’s position on the Amtrak organization chart suggests the Anderson-Hylander team won’t tolerate foot-dragging. The entire railroad industry is dealing (some would say struggling) with PTC’s challenging rollout. Every entity has a limit on how much change it can digest at any one time. Many believe PTC has stretched railroads to their limits. Further, designing and installing truly new training programs aren’t cheap. Strategic reconstruction of a score or more of qualification and certification programs would be an enormous task. It is into this uncertain regulatory, labor and industry environment that any Amtrak-sponsored airline-style CRM initiative would fly. CRM champions would certainly need to fasten their seatbelts. Indeed, five-point restraints might be necessary! Undeniably, Amtrak is the 500-pound lowland gorilla when it comes to the U.S. passenger rail industry. And if CEO Anderson and Chief Safety Officer Hylander moved forward with a CRM-based crew training and operations management proposal, the program could quickly become a passenger rail industry standard. By moving ahead with both PTC and a version of CRM, it’s possible that Anderson, aided by Hylander, might go down as both an outstanding passenger airline CEO as well as a trail-blazing passenger railroad CEO. And if Amtrak (and other subsidized passenger railroads) were to start turning in safety records like the airline industry, Congress might more favorably view their future appropriations requests. SWITCH RUN-THRU: Nothing says “Human Factor Incident” like the buckled hardware and wheels on the ground around a run-thru switch. This switch had been in the same location since the railroad was built early in the past century. On many short line and regional railroads, Human Performance failures at switches and derails account for more than half of all reasonable-cause drug tests and decertification procedures. CHECKLISTS: A CRM hallmark is putting two sets of trained eyes on safety-critical duties and decisions. A major airline’s captain and first officer use one of at least three checklists required before an MD-90 jet aircraft can push back from a boarding gate. DISASTER STRIKES! “When all the Swiss cheese holes line up.” Multiple factors contributed to shoving empty freight cars off the end of an industry track into a gravel pit. The poster and a rules review were the core of a task-oriented Operating Crew training program applying modified CRM communication procedures. After training, shoving movement failures dropped significantly. Creating this one lesson consumed eight man-hours. 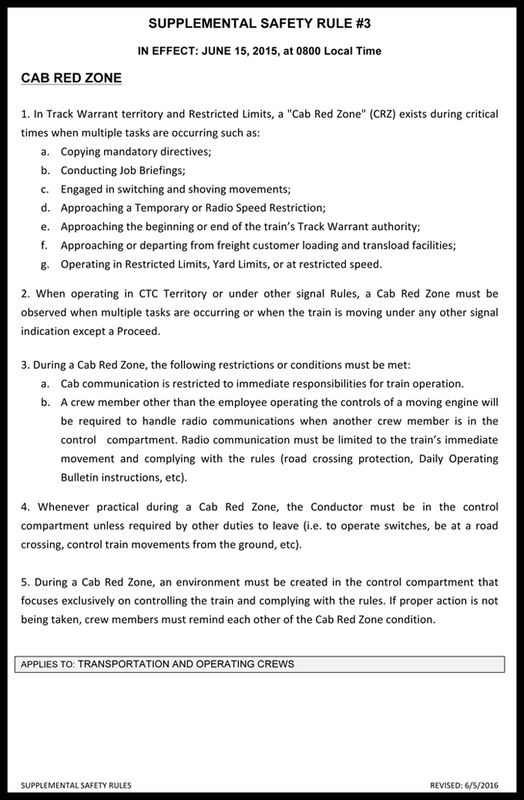 CRM-INSPIRED SAFETY RULE: Cab Red Zone rules adapt CRM procedures to focus operating crews’ attention on challenging situations. Reducing unrelated activities improves crew performance. Safety, translated from planes to trains?